CANNABIS ON THE SCENE | Chatham-Kent Agriculture Development | We Grow For the World! With the legalization of recreational marijuana set for October 17, 2018, have we fully considered the influence this new commodity will have on agriculture in Ontario? For instance, food production may be affected by competition for farmland and farming expertise. Also, international trade partners may take greater caution when importing Canadian food products. Under the federal legislation to legalize the product, cannabis will be permitted for cultivation on agricultural lands. 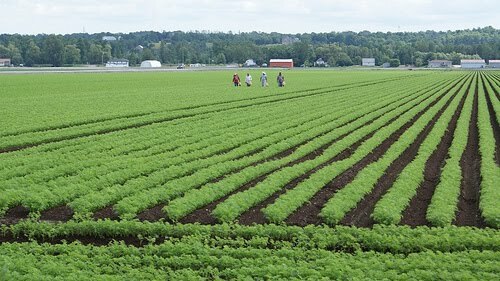 Cannabis growers will be competing for these lands with Ontario’s food producers adding a new dimension to farmland values. Cannabis growers seem to have deep pockets and with legalization, in practice, is there anything in the way of restricting these growers from converting any amount of agricultural land that had been used for food production? To date, reports are that this seems to be the case evidenced by Canopy Growth’s greenhouse acquisitions across the country. Among other acquisitions, the multi-billion-dollar medical cannabis company has taken over a 700,000 square foot organic greenhouse in Mirabel, Quebec, previously owned by the largest North American producer of pink tomatoes. In Ontario, Aphria, another medical cannabis company, has partnered with Double Diamond Farms to convert 32 acres (1,400,000 square feet) of greenhouse space in Leamington from vegetable to cannabis cultivation. With a significant expansion of the cannabis industry in Canada, the subsequent demand for employees with expertise in greenhouse cultivation will follow suit. If cannabis producers were to draw enough land, farmers and expertise away from food production and into the cannabis industry with investments pouring into cannabis production, what will happen to food production in Ontario? And, will all this activity divert the financial resources needed for traditional farming? Surveys predict that 40 per cent of adults will participate in recreational cannabis use, to some degree. It is perhaps ironic to think we may lose acreage for food production at the same time as almost half of Ontarians are looking for more afternoon snacks as a result of their cannabis use! A second issue involves food trade because, when grown beside other crops, cannabis may pose a risk of contamination. As an illegal drug in most countries, this may complicate the exportation of Canadian food products. An issue further out on the horizon is the integration of cannabis into the food industry as “edibles.” Although not yet legalized in Canada, edibles may also raise eyebrows because of the potential for error throughout a supply chain that supplies both non-cannabis and cannabis-infused foods. As for potential solutions, some have suggested designated areas be legislated for cannabis production. This would help to address both the issue of competition for land and contamination risks for export of other goods. For now, we will have to wait and see what impacts do transpire and what solutions may be needed to address problems as they arise.